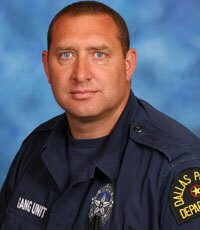 Senior Corporal Norman Smith was shot and killed as he attempted to serve an arrest warrant. Corporal Smith and several members of the Gang Unit went to a home on Wadsworth Drive in Dallas to service an arrest warrant for aggravated assault. When Corporal Smith knocked on the front door of the home, he was shot and killed. Members of the Dallas Police SWAT team were able to make entry into the apartment and arrest three suspects, including the suspected shooter. The shooter was convicted and sentenced to life in prison. Corporal Smith had served with the Dallas Police Department for 18 years and was assigned to the Gang Unit; he had previously served with the United States Marine Corps. His murder occurred on the day before this 18th anniversary with the department. Corporal Smith is survived by his wife, who also serves with the Dallas Police Department, and two children. On today, the 10th anniversary of your death I would just like to say thank you for your service and sacrifice for the citizens of Dallas. And to your Family and loved ones, I wish to extend my deepest sympathy.